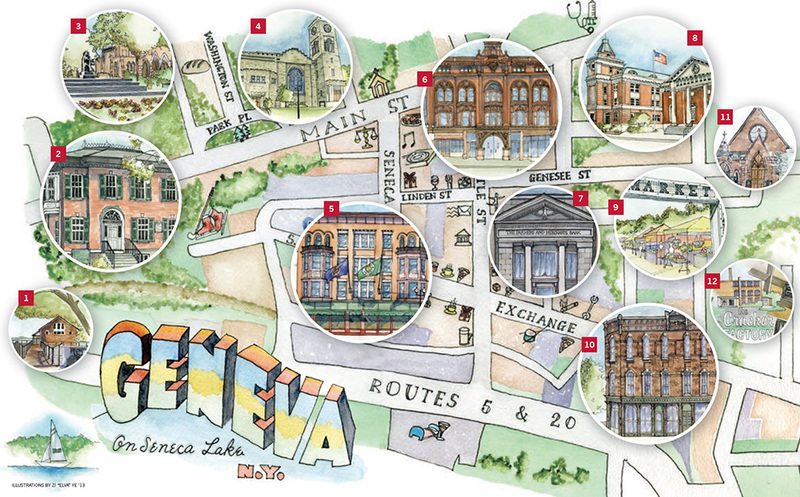 If you are curious about Geneva, here’s a beautiful watercolored map, produced by an alum of HWS, Elva Ye. This interview was published in the Summer 2014 issue of the Pulteney Street Survey, the official magazine of Hobart and William Smith Colleges. The Summer ’14 issue was devoted to the community, including pieces on the town of Geneva where the college resides. During a yearlong fellowship at the Winterthur Museum and Library in Delaware, made possible by the National Endowment for the Humanities, Assistant Professor of Art and Architecture Kirin J. Makker is conducting research for her book project, The Myths of Main Street, which “analyzes how the current trope of Main Street USA (local, self-sufficient, close-knit, middle-class, homogenous) is challenged by a historical reality of networked, nationally-connected, diverse place.” The book is planned for publication in 2018. Makker’s other book project, Village Improvement in America 1800-1930, is under contract with the Library of American Landscape History and is due out in early 2016. Makker also writes for the popular press, her most recent piece appeared in Dwell. Published in March 2014, the article profiles Amy and Brandon Phillips, owners of Miles & May Furniture Works headquartered at the Cracker Factory in Geneva, N.Y.
Q: Where did this idea of a nostalgic “Main Street” come from? A: There are many answers to that question, so numerous that it’s impossible to identify just one source of nostalgic Main Street. 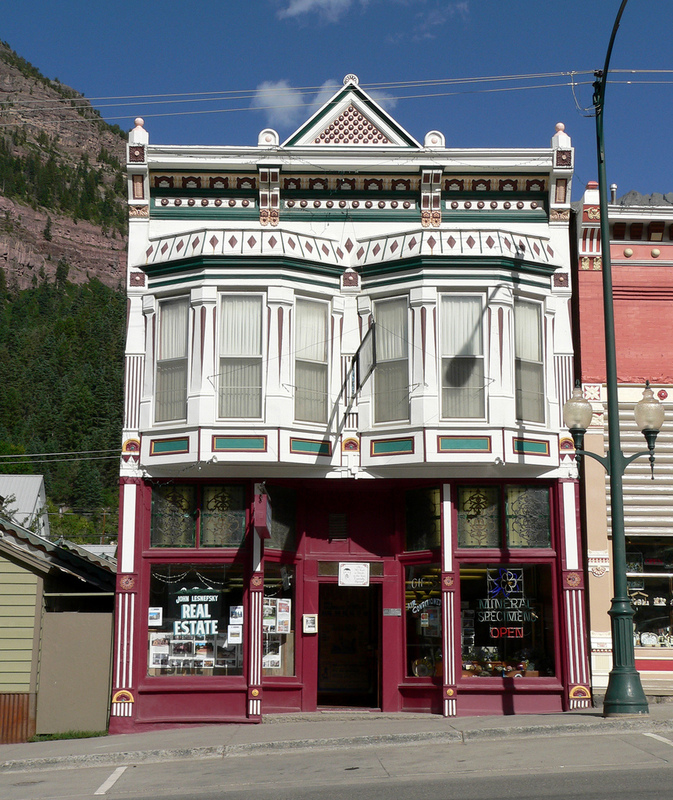 In American and British planning, small towns have been a subject of study since the profession began in the late nineteenth century. People were fearful of dense industrial cities and larger villages, with their apparent self-sufficiency and easy access to the countryside fostered many theories about ideal places to live modeled on cities around 20-30,000 people. Ebenezer Howard’s 1902 concept of “garden cities” is probably the most well known example. In popular culture, small towns have been narrative currency since their boom period in the 1880s; it’s often the case that ‘ideal’ versions of American concepts run parallel to the development of their inspiration. But to get back to your question, one way of looking at the source of nostalgic Main Street is to look at our recent history of small town preservation and the transformation of rural village economies from manufacturing and necessities-of-life small business to a set of shops purely about leisure and lifestyle. The source of this in the last quarter of a century is in the National Trust for Historic Preservation’s launch of their Main Street Program, started in 1977. The program was started specifically to educate and help direct local rejuvenation campaigns in communities of 5,000 to 38,000 people. The program’s pilot towns were remarkably successful – Galesburg, Ill., for example, saw a 95% increase in downtown occupancy. 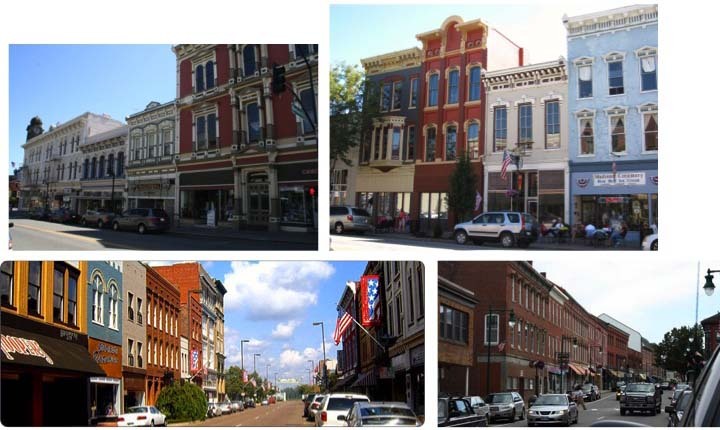 By the early 1980s, the National Main Street Center had grown into a robust economic revival model for small town America based in coordinated public-private partnerships, adaptive re-use, incremental growth, and clever promotional programs. The whole program was about developing a “tourist” economy using historic building stock, renovating it into a coordinated set of leisure-based businesses. Since 1980, there have been hundreds of towns across the U.S. that have successfully worked with the National Main Street Center and the program is responsible for fostering more than $55 billion in reinvestment. In addition, their approach and economic model has been used by thousands of other towns, even if these places don’t join the Center. It’s become THE approach to reviving small town America. This is all wonderful, but there are things we should be wary of. Their formula- looking backward to an ideal Main Street- also traffics in nostalgia. There’s a little too much “remember when…” going on in the marketing materials of many small towns eager for a tourist market. This can backfire in terms of using this type of marketing to draw new residents. The whole look of the nostalgic Main Street is generally about giving visitors a way to step back in time and out of reality. I’m not certain that this strategy is the best for giving a town a vibrant future, where a diverse cross-section of people might want to make their lives. If you want to draw young people to a town, is “antiquing” it the only strategy worth pursuing? Is a Main Street of ‘leisure’ and ‘lifestyle’ ultimately going to foster a rich community life? Sure, it works and it’s better than a dead downtown, but can’t we do better and evolve this model? That’s my concern. There is also a romance we associate with the architecture of Main Street that’s not accurate to its history of development. 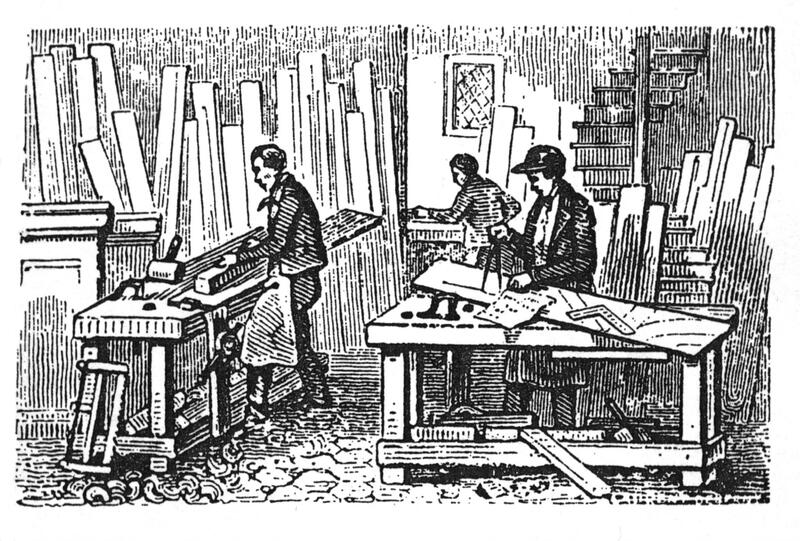 We tend to view it as a relic of simpler past, when people made things by hand, there wasn’t fierce competition or a need to get the cheapest good, and everything in one’s midst was made locally. The truth is that the beauty and quick growth of Main Street, its frenzy of economic and physical development, occurred because people were clever and took advantage of the latest technologies and markets. 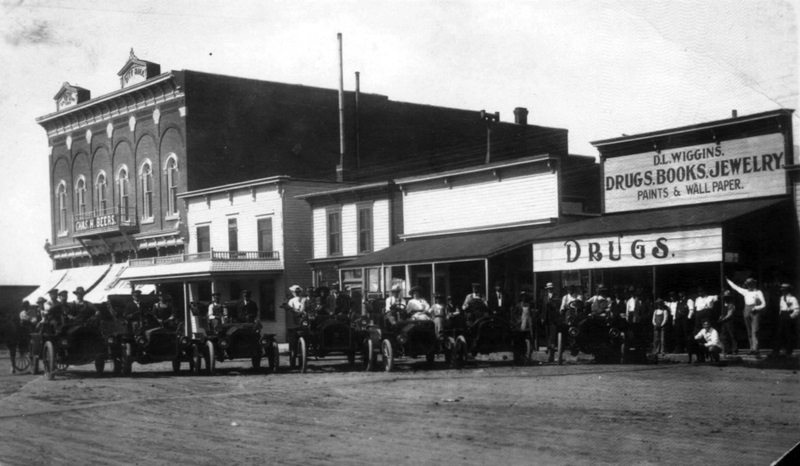 There was nothing quaint and simple about life on Main Street in 1900. One might even have called it “cutting edge”-they didn’t want to stay small, they wanted to be big and prosperous, however and in whatever method they could. Q: What happened to small towns in the bust (the Great Depression) that followed the small town boom? A: As cities struggled, so did small towns. But the truth is, small towns had always been struggling as a type of urban economy because they were not large, and thus their economy was typically less diverse than that in a dense city. When a market shifts, there are always remains of the previous boom, relics of a former time. Small towns are, and have always been, in a process of overcoming the position of being remains, just as cities have, but at a much slower rate of redevelopment. In a way, one of the reasons that the small town is a site of nostalgia is because it has been affected by busts and then has been very slow to recuperate, if it does at all in one person’s lifetime. Q: What about today-what’s the outlook for small towns? What causes today’s Main Streets to thrive? A: Twenty years ago, if a resident wanted to gather some neighbors together to sponsor a public art project, they had to go to the public library and do hours of research in periodicals or newspapers to find information on how to run a competition, select an artist, develop a PR campaign, fund-raise, work with the city to implement, etc. Now, you just do an hour of searching on the Internet and you’re suddenly connected with all the resources you need to mount the project successfully. Five years ago, you would not have seen a small downtown shop raise more than $8,000 in a six-week fundraising campaign in order to set up space on their second floor for drinking coffee and browsing through retail. But this year, that’s exactly what occurred in Geneva [at Stomping Grounds]. Whereas suburbia used to be the ideal among the young workforce, it’s clearly not the one and only American dream out there these days. Many young workers are choosing to live in urban settings. Small towns are not densely urban, of course, but they are sometimes preferred to surburbia by these folks. 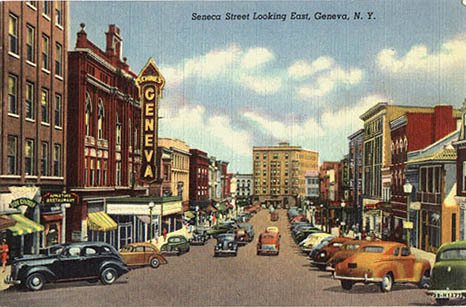 Geneva has been on the upswing because it has an enlarging and active group of residents, a critical mass of people really invested in making the downtown into a livable neighborhood. But it’s not just that social networking has gathered interested parties in small towns together around the issue of livability and civic engagement (which it of course has), but it’s also that the small town resident can become so much more informed about possibilities and all the know-how needed to make the changes they want to see. Honestly, the future is very bright for small town America. In early April, I went to the University of Connecticut Archives and Special Collections to spend a couple of days sifting through the records of E. Ingraham Company Records. A major part of my research methodology involves following the trail of company goods right at the moment big capitalism really spread its wings. My hope is to track where a handful of companies sold their goods in order to describe a product’s national distribution, and hence its availability across small town America. I have found, and my research will argue, that one of the reasons that small town America is such a consistent idea in the nation’s cultural language is that the goods exchanged there had both local and national parameters. Some of this research has had to do with companies that literally produced small town America: the storefronts, the brick-making machinery, the lamps and posts. But other parts of the research is about the everyday objects that were sold in small towns, and how most of them during the period of small town America’s boom were not made locally or even regionally. The retailers were locals, but the items for sale on Main Street were typically sourced from manufactories or large distributors in cities. Again, Main Street is tied to the economy of very large cities and vice-versa. For example, a $2 watch made by the E. Ingraham Company in 1898 was made in Bristol, Connecticut but was sold on several thousand Main Streets all across America in general stores or small jewelry shops. Ingraham was after the mass market that the very successful company Robert H. Ingersoll had been selling to. Ingersoll had shrewdly introduced a $1 pocket watch, the “Yankee,” in 1892, stumbling into an enormous mass market of working- and middle-class consumers interested in owning timepieces they could afford. Most cheaper watches at the time were in the range of $4 to $6. 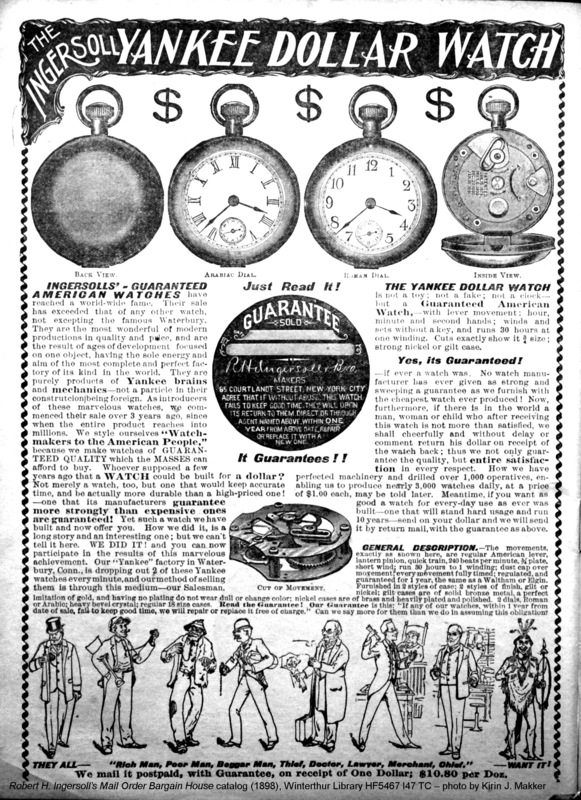 Although Ingraham couldn’t make a quality watch for that little (the Ingersoll watches, not surprisingly, were cheap but not known for quality), the did start making a $2 watch by 1900 and these sold quite well, judging by how long they produced this watch (until the 1950s). Yet, when I dug around the Ingraham Company archives at UConn, I had some trouble finding records to support their efforts to take a share of the Ingersoll Yankee’s market. As I said, I set out to spend all my time on the Ingraham Clock Co. archive. However, it turned out that what I was really hoping to find within my time period (1870-1930, Main Street’s ‘boom period,’ so to speak), wasn’t so easy to cull. I had set out to identify names and locations of retailers who ordered Ingraham watches for their shops on Main Streets in towns all over the country. Or possibly find advertising by the company that included testimonials from retailers in small towns. I have found these types of testimonials for Elgin watches of the period, so I was hopeful. However, most of the Ingraham Company’s order records at UConn’s Archives and Special Collections show sales to large distributors in cities. In addition, most of the records in the collection were from the 1940s and 50s (just the luck of what records survived, unfortunately). I did find contract letters with Sears from the 1930s, in which the mega-retailer agreed to uniquely market Ingraham watches in their stores and catalogs. But I needed letters with Sears or Montgomery Ward from around 1905 or more information about the distributors who bought $2 watches in large volume and then re-sold them in small batches to shop owners in the nation’s towns. That information may or may not be available in any archives, so in the end, the Ingraham $2 pocket watch story might not make it into the book. What did I find? A glorious collection of ephemera and sales records for the E.E. Dickinson Witch Hazel Company of Essex, Connecticut. One of the chapters I’m writing is on the variety of goods and services related to a townsperson’s health, all of which they could get on Main Street. There was quite a bit of overlap between what was a “good”, a “service” and also a ways to participate in community life in the many shops and offices in downtown small town America between 1870-1930. For example, one might go to the town druggist to purchase a prescription from a local doctor, a box of candy, or sit at the soda fountain and gab with friends over a strawberry fizz. Barber and beauty shops were where one got one’s haircut or styled, but also where one socialized with a gendered group of residents. Doctors were where one received diagnoses and health recommendations, but also where one might purchase a drug remedy (many physicians made their own drugs during the early part of my period of study). I’m interested in looking at how Americans living in small towns attended to their health needs because understanding healthcare history before drug and health insurance, medical malpractice, and managed care may be valuable for understanding our contemporary struggles with the industry. Or at the very least, this history offers an interesting comparison to the practices and standards the current day. 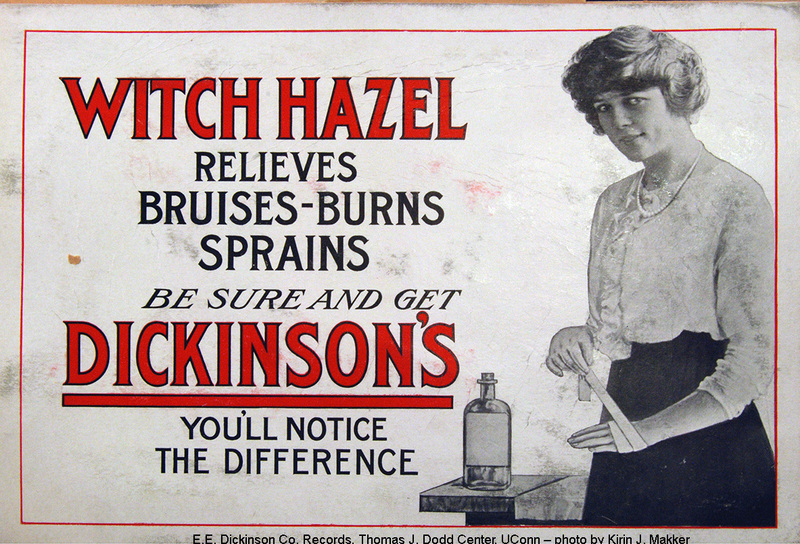 The story of Dickinson’s Witch Hazel fits right into this chapter because it was a factory-produced astringent that became an everyday remedy for minor ills. It was sold all over the country in drugstores and used extensively in small town doctor’s offices. And this time, I found records that show national distribution. 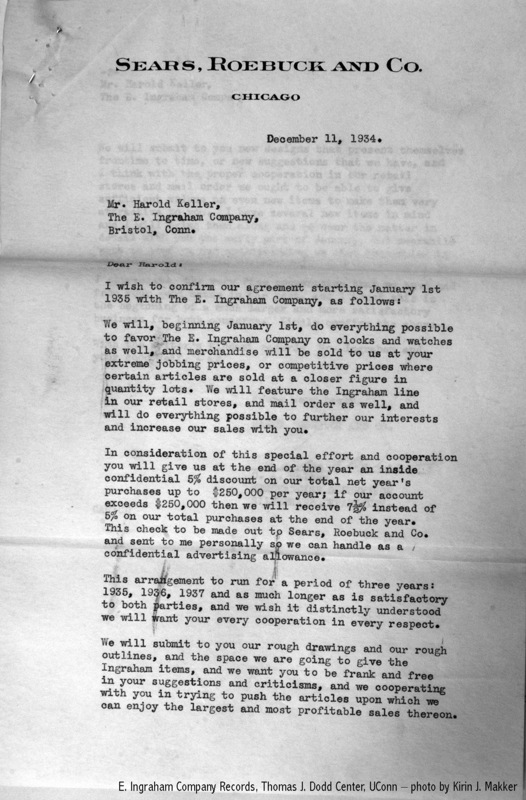 For example, during the mid-1920s there were many letters between Dickinson executives and the Druggist Supply Corporation (DSC). The DSC was made up of retailers across America, many of which were located in small towns (Fresno, CA; Peoria, IL; Ottumwa, IA; Burlington, IA; Fort Wayne, IN; Rock Island, IL among many others). By working with that organization, Dickinson assured that they would get their product into those shop owners’ hands. There were also several large company scrapbooks with hundreds of ads, letters from happy vendors, testimonials, and the like. For example, there was a letter from the owner of a drug store in Grand Rapids, Michigan. He was thanking the Dickinson Company for sending him a set of booklets to give out to his customers with their purchase of a bottle of Witch Hazel. With his letter of thanks, he included a clipping from the local newspaper called “The Enterprise” which he produced, something common in small town America where businesses were typically very diverse. The clipping documents his announcement of the Witch Hazel booklet’s availability. He also noted that he gave a bunch of the booklets to a teacher at a nearby rural school for their students. This letter offers a wonderfully grounded example of how Main Street used to work–how, as I said earlier, it functioned locally, but drew on a national set of goods and marketing materials. Shop owners were an active part of the process of embedding national goods with a sense of local purpose and circulation. This drug store owner was part savvy entrepreneur, but also an educator, having handed over a bunch of the booklets to a rural school just outside of his town. 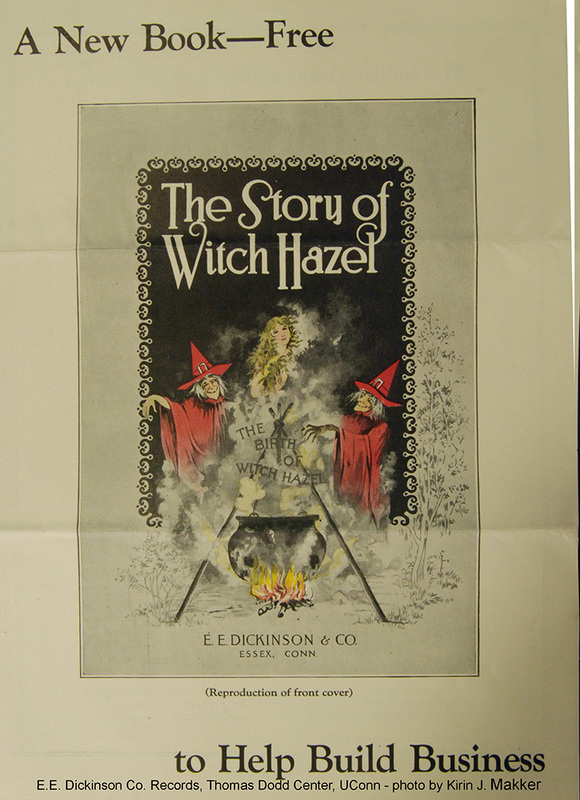 Note: This visit to UConn’s Archives and Special Collections was funded by a 2014 Strochlitz Travel Grant. Travel Grants are awarded bi-annually to scholars and students to support their travel to and research in UConn’s Archives and Special Collections. Fellows are required to submit a blog entry to UConn on the work done at the Collections within six-weeks of their visit. Part of the above report also draws on materials at Winterthur Library, where Dr. Makker is also being supported by a 2013-14 National Endowment for the Humanities residential fellowship. A version of this essay also appears on the UConn Archives and Special Collections Blog. The team at UConn has uploaded digitized versions of several Ingraham catalogs from the early 20th century. A catalog from 1918-19 can be see here an archive.org. For some fun reading about the use and production of witch hazel by humans, see November 2012 in The Atlantic “The Mysterious Past and Present of Witch Hazel”. This preoccupation with the “hand-made” is something linked to nostalgia and general romance for pre-modern times. In the case of Made Collection, there’s an obvious effort to show us how the goods for sale are not only made here, but made with care and attention—not unlike the old days when standards were higher and the process of production slower. One infers from surfing around Made Collection’s site that everything featured was not only made in the States but also not mass-produced in factories. This stuff was made by hand. 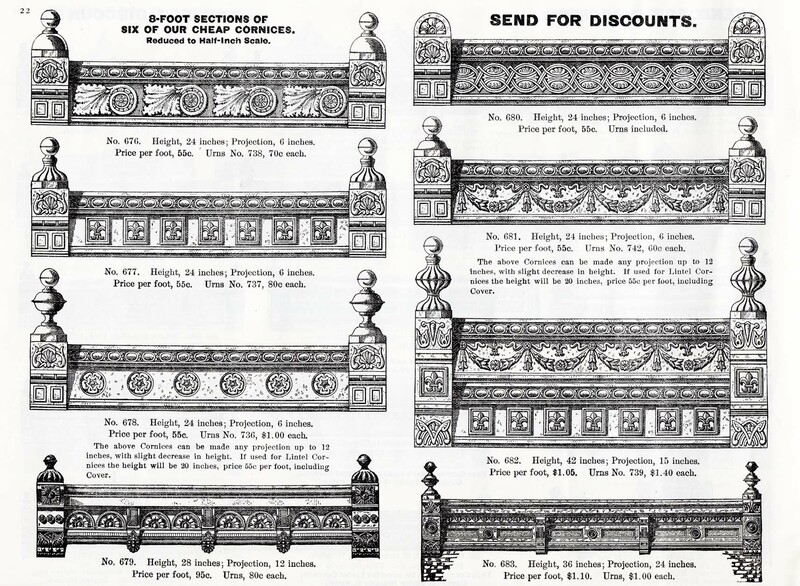 from 1898 Mesker Brothers catalog — Cornice anyone??? When towns were booming during the 1890s and into the first two decades of the twentieth century, settlers needed to build quickly and cheaply. Metal storefronts cost around 1/3 of what a stone building cost. Townspeople also often had to build in remote locations, places that might be far from quarries, skilled stone carvers, brickyards, etc. Although wood was used in building, it was risky: one didn’t want one’s building to go up in smoke from a negligent tenant. There was a whole niche market, in fact, of building materials for this population. (If you are interested in learning more about the development of pressed-tin ceilings, for example, I highly recommend taking a look at Patricia Simpson’s book Cheap, Quick and Easy: Imitative Architectural Materials. It’s a great read.) 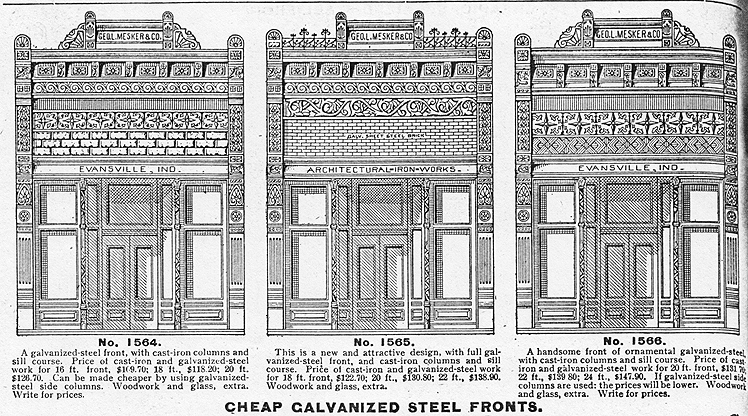 The $126.70 storefront pictured above is from and 1898 Mesker Brothers catalog. Darius Bryjka maintains a very smart and fun blog about Mesker fronts that you can find here. Partly because of Darius and partly because the Meskers were so successful selling their fronts to the small town builder, the Meskers have gained prominence in the history of nineteenth century metal storefronts (Okay, maybe Darius isn’t responsible for the prominence of Meskers in the history of vernacular architecture, but — and he of course humbly protests this claim — but his blog is still really really great and he was the original force behind the ongoing project “Got Mesker?“). But even beyond the Meskers, there were hundreds of other companies and foundries offering metal building components. And it’s this regional distribution that I personally find fascinating. 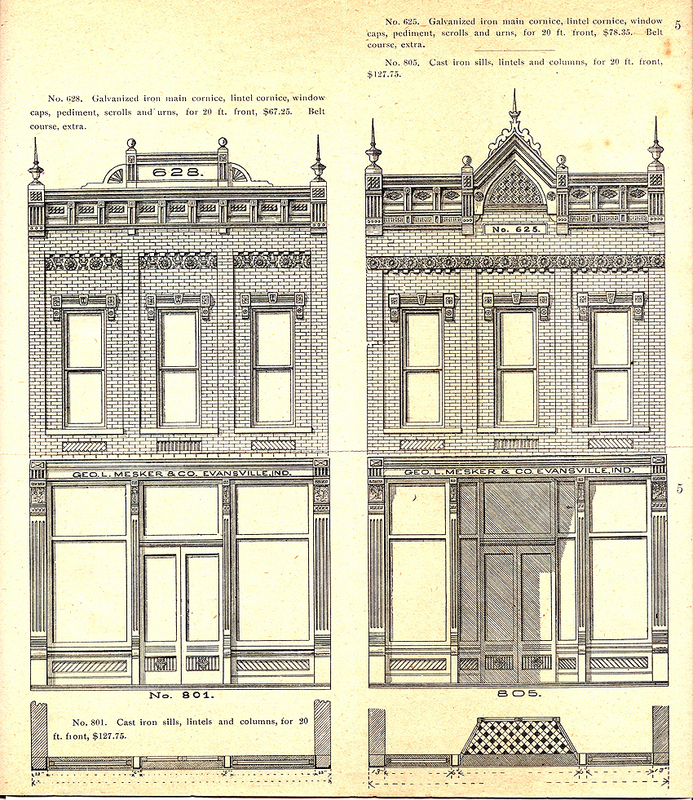 While the Meskers sold nationally, there were other companies that manufactured storefront components as side jobs for regional markets. 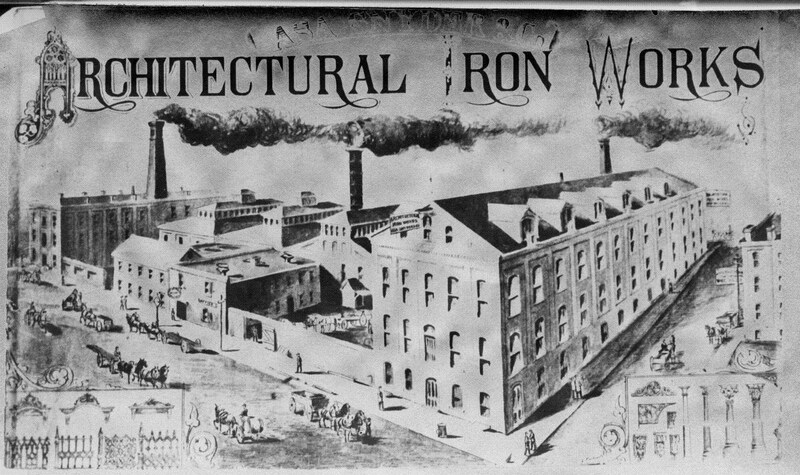 For example, Union Iron Works in San Francisco, which mostly produced steam engines, got its first big revenue stream through the selling of architectural iron castings made from fire-ruined safes, hinges, stoves and sheet iron bought on the cheap. Salvaged iron purchased for ¾ of cent per pound was refabricated into a host of building ornaments for structures going up in outlying areas, turning a tidy profit at 20 cents per pound. Not too long ago, I found some storefront components by Union Iron Works on some buildings in downtown Petaluma, CA. That a storefront in Petaluma, CA was assembled with building components from San Francisco, and made from recycled steel to boot, demonstrates how complex the production of Main Street really was. It’s a reality check, to be sure. These Union Iron Works storefronts in Petaluma were not made by Mr. Jones, local carpenter, with wood chopped down from his neighbor’s woodlot and hand-made with skills passed down from his grandfather. Okay, it’s not romance, but hey! It’s just as beautiful and wondrous a story! There were people thinking outside the box here! Being industrious and clever! Making America with innovative business practices and new technologies! One of the myths of Main Street is that it was Local. I think because small town America is steeped in ideals, it’s difficult to be precise about what “local” meant. In today’s Main Street/Wall Street dialog, local suggests small business operations, local industry and labor. In lectures on my book research, I have occasionally started my talks with a blank slide that says “pop quiz” (I stole this brilliant idea from a colleague of mine when I was teaching at Smith College, in Northampton, MA and I have shamelessly employed it on many an occasion. I don’t care who you are or if you’re 75 or 18, if someone standing at the front of the room says “pop quiz!” you find yourself uncontrollably attentive). Question #1: Where are we? After a fair amount of guessing from folks, I throw up the next slide. And (hopefully) my point is made: Main Street has a “visual vocabulary” that spans every region of the United States. This is just what small town America looks like! It’s got highly ornamented two- and three-story buildings. There are clean sidewalks with awnings to walk under. The road is nicely graded. There are streetlamps, the occasional park bench, trash receptacles, and maybe a finial here and there. There are leafy street trees. Whoaa. Where’s all the quaint prettiness? Maybe we don’t know that much about Main Street. My research looks at how Main Street happened — how it was physically built, assembled, styled, re-organized, and cleaned-up. Digging around in archives has convinced me that we don’t know very much about the developmental history of Main Street, that we tend to accept some givens: it was locally made, (“no corporate Wall Streeters on Main Street!”), conservative (“Why change? It’s always worked! We don’t need crazy new ideas from those city folk fussing with our way of life!”), and autonomous (“We look after our own! No outside influence here!”). Along the way, Main Street, the physical place, became an archetype of American values. Main Street is a physical place, but it’s also a community ethos. Well, in my profession (that’s architecture and urban planning), this Main Street imagery reigns a bit unquestioned in design proposals and policies. And well, I have a problem with what feels too much like blind faith in a nostalgic idea about small town life. I think we planners need to get more informed about what we’re referencing in our proposals — we have tended to recreate small town America in suburbia, as if the community ethos we associate with Main Street will magically grow from the ornamented buildings and streetscaping. Hold on a minute! (you say) You think planners are vacuous automatons, employing small town imagery without realizing that they are recreating a place from the past? No. Of course not. I’m a planner too, you know. And I personally LOVE ye olde small town Main Streets. I just think that the small town has more to offer contemporary planning and design than superficial imagery.